• A new cloud type? 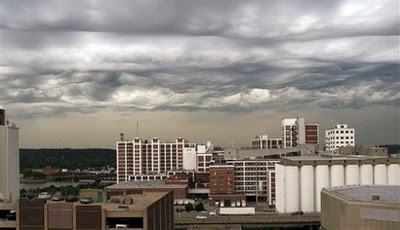 A photo taken in Des Moines, Iowa in 2006 has sparked a meteorological debate. If you look at the photo below, you'll see something very odd. The photographer said "It looked like Armageddon". I assume she meant the movie.... no wait, I'm thinking of Independence Day. I agree, looks pretty freaky. But a new cloud type? Well, here's my favourite part of the story. I found out there is such as thing as The Cloud Appreciation Society! Yes, if you love clouds this is the place to be! I quote : "At The Cloud Appreciation Society we love clouds, we’re not ashamed to say it and we’ve had enough of people moaning about them ... see how we are fighting the banality of blue-sky thinking." And check out this picture on the Cloud Appreciation Society website. Taken in Scotland - same kind of cloud, but scarier. The Cloud Appreciation Society are pushing for this to be classified as a new type of cloud. Or is it aliens? Not much in the way of clouds in Phuket today. I guess you might call it "partly cloudy", but it was hot as a squirrels nuts in a frying pan again. I think we are going to crack and install aircon in the living room. And I might just join the Cloud Appreciation Society!